The “Night Clock” was designed by papal request. Once upon a time, there was a pope who couldn’t sleep… That could be the opening line of a story—a story about one of the world’s great clocks. If you’ve ever lain awake at night, unable to sleep and watching the passage of time on your illuminated alarm clock, it’s a tale you can appreciate. Pope Alexander VII, who served as pope from 1655 to 1667, was born Fabio Chigi in 1599. Though many details of his life have been embellished in historical texts—sometimes flat out fabricated—it’s generally agreed that he endured a lifetime of health issues. For him to suffer from insomnia isn’t surprising. As a son of the Chigi family of Siena (possibly lesser known today, but no less influential than the Medici family of Florence), Alexander VII was used to being surrounded by very nice things. His great-grand uncle, the banker Agostino Chigi “the Magnificent,” was, in his day, the wealthiest private citizen in Italy. Palazzo Chigi, the family’s historic palace in Rome, is now the official residence of the Italian Prime Minister. Alexander VII’s personal library of rare manuscripts is now in the collection of the Vatican. The Chigi family mausoleum was designed by the artist Raphael (a personal friend of Agostino), and Alexander VII’s own tomb is an enormous red jasper and white marble monument at St. Peter’s Basilica, designed and executed by Gianlorenzo Bernini. No wonder, then, that the pope would opt for an artistic, elegant and expensive solution to his sleepless nights. Fortunately for him, he had the official Vatican clockmaker at his disposal. And that clockmaker, Pietro Tommaso Campani, was the brother of Giuseppe Campani, one of the great inventors of the 17th century. The pope commissioned Pietro Tommaso to devise a clock whose dial could be read at night, presumably while the pontiff was tossing and turning. It also had to have a near-silent mechanism to muffle the sound of the ticking pendulum—the sort of noise that always seems to intensify when you’re awake in the wee hours. In 1656, the Campani brothers presented the pope with a “night clock.” A stunning work of art, it was also a remarkable example of technology. Its shortened pendulum ticked unobtrusively inside the mantel clock case. Its “wandering hour” dial was something altogether new; a metal disc with cutout numerals that rose on the lower left of the clock face and migrated in an arc to the lower right over the course of an hour. What made this clock uniquely suited for night was its illumination. Light from an oil lamp inside the wood clock case shone through the cutout numerals on the dial, making them visible in a darkened room. Smoke from the burning lamp was channeled out the back of the clock case through a copper flue. It wasn’t safe but it was extraordinary, and the pope was so delighted with what the Campani brothers had made that he granted Pietro Tommaso a papal privilege similar to copyright protection on the night clock design. Considering the cost and the workmanship involved, the Campani brothers made a surprising number of these clocks, including several made at the pope’s request to be given as gifts. Queen Christina of Sweden, who’d famously converted to Catholicism and moved to Rome at the pope’s invitation, owned one. So did King Philip IV of Spain and John II Casimir, king of Poland. Giuseppe Campani, known especially for making scientific instruments and lenses used by astronomers, continued to refine his night clock mechanisms, eventually devising a night clock for French King Louis XIV that used a system of lenses to project the image of the illuminated dial on the king’s bedroom wall. 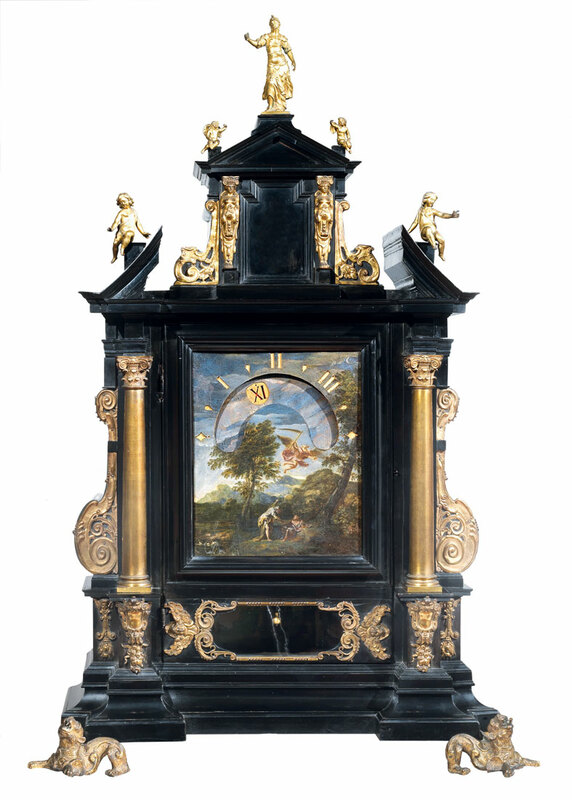 There are signed examples of Pietro Tommaso Campani night clocks in the collections of the British Museum and the Kunsthistorisches Museum in Vienna, and Italian antiques dealer Alberto di Castro of Rome offered a signed example from 1670 for sale at the TEFAF New York show in October. Sumptuously painted with allegorical or religious scenes, elaborately decorated with gilt bronze and sometimes with marble and semiprecious stones, they are the stuff dreams are made of—and proof that sleepless nights can lead to truly remarkable ideas.